Birds chirped and flew from chimney to chimney, and plants grew amongst the bricks. People peered into the gaping holes. Rust spread, windows smashed, and the building started to crumble, but the power station, Battersea Power Station, was still magnificent. Thousands of people stood inside it that weekend, gazing up at the remains in awe. 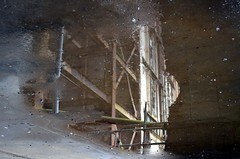 Photos on Flickr: Battersea Power Station.